Tunisian blood oranges ripen at the exact time as the Chetoui and Chemlali olives. 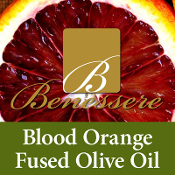 We have them pressed together to obtain this beautiful citrus fused olive oil. Very versatile and goes well with seafood, chicken and summer salads. Decadent with Dark Chocolate Balsamic!